KarenzMOI-EG™ has a new structure that gives flexibility as well as KarenzMOI™ structure. The double bond reactivity and Isocyanate reactivity are same level as KarenzMOI™ . And more, it balances flexibility with Strength. KarenzMOI-EG™ balances Flexibility and Fracture strength which are contradicting properties. Elongation is five times as large, while fracture strength is maintained at the same level. KarenzMOI-EG™ can improves the adhesion strength to glass, metal, resin, etc. Cure shrinkage is reduced by 40%. Curing rate is maintained at the same level. *All carried data are for reference. It’s not a guarantee value. 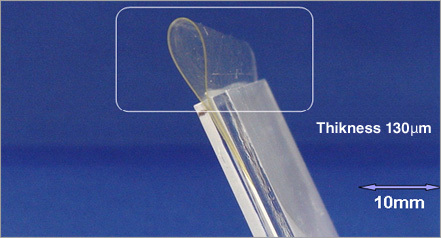 KarenzMOI-EG™ is available for the following areas because of its high performance of Adhesion, Flexibility, photo-curing. This product is only for industrial use. Please make contact with us, when you thing of other uses. Please read our MSDS before using KarenzMOI-EG™ . Handle KarenzMOI-EG™ with attention to the following, because it causes the corrosion of eyes, mucous membrane, skin, and so on, and is hazardous. ・ Educate handling personnel about the toxicity, the reactivity, and so on, of KarenzMOI-EG™ , regularly. ・ Prevents from the direct contact of KarenzMOI-EG™ to skin, eyes, clothes, and inhalation of vapor and so on. ・ Take off the clothes contaminated by KarenzMOI-EG™ at once, and dump them. Wash the contaminated area of skin with water adequate, with soap, and with water, again. Prevent from the contact with water, heat, strong base and the compound with active hydrogen (alcohol and amine). It reacts with the damp, and formate the insoluble urea and carbon dioxide. Notice the formation of urea, because it causes choke of pipes and valves. It is stored up in the cool and dark space. Use the container made of glass, the polyethylene and so on. *This information contained herein is based upon data considered true and accurate. However, SHOWA DENKO K.K. accepts no responsibility or risk which may result from the handling and use of product or for infringement of any patent.